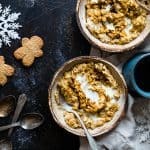 This quick and easy gingerbread high protein oatmeal recipe is a spicy-sweet, cozy breakfast that is healthy, gluten free and ready in only 10 minutes! This oatmeal protein content is over 20g too! Pouring up a steaming cup of Joe, snuggling up in a cozy, wooly, blanket and diving FACE FIRST into a bowl of CREAMY, spicy-sweet protein oats. This little picture has basically been on REPEAT in my morning-self’s life and I intend for it to ALSO be in your real-person life too. In my mind, there is NOTHING as cozy as gingerbread. 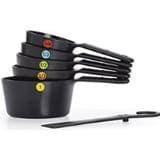 From the sticky-sweet and RICH flavors of molasses to the heavy-PUNCH of ginger that wakes up your senses and warms up the back of your throat, to the kiss of cinnamon that swirls it ALL together in comfy-food GOODNESS. There is just NOTHING better. It IS the holidays though so MAYBE IT IS..? I’ll let you be the judge of that. Anyway. Back to this gingerbread high protein oatmeal recipe. Think of your favorite Grandma’s baked-with-love healthy ginger snap recipe and then picture morning-you rolling groggily out of bed, barely being able to pry your eyes open and then -WHAM – gingerbread yumminess WHOLLOPS you right in the taste buds, waking you up AND making you feel like you’re eating cookies for breakfast. I mean, OBVI munching on this protein oatmeal is a much creamier, softer, less “snap-y” version of the beloved Christmas cookie, but it has ALL the same flavors. Yes, oatmeal does have protein! A typical serving of 1/2 cup of rolled old fashioned oatmeal has around 5g of plant protein! But with THIS gingerbread oatmeal? We added protein powder so it has ALL THE PROTEIN. 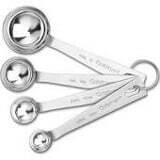 <–over 20g! Waking up tired you AND pumpin’ up those muscles ALL AT THE SAME TIME. Protein oats? WE LIKE YOU. Mostly because of warm-cozy-spicy-sweet cookie tastes for our do-not-wanna-do-the-mornings selves, but also because you are SO EASY and take only 10 minutes to make. Internet friends. You read that right. 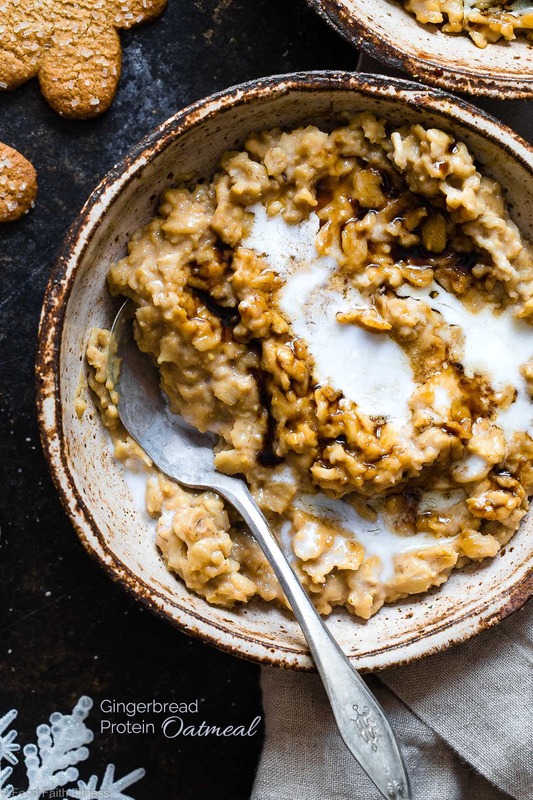 There are only 10 minutes between you and sweet, rich swirls of molasses-y, fluffy oatmeal, studded with creamy vanilla and little pockets of warm ginger and cinnamon in EVERY MOUTHFUL. 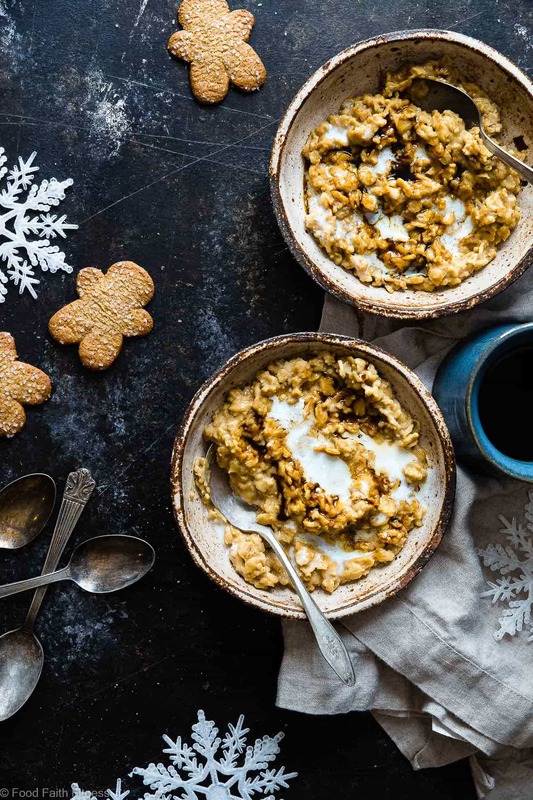 There are also hot stoves between you and aforementioned holiday cheer in the form of breakfast, so let’s make sure we’re MOSTLY awake before attempting this gingerbread high protein oatmeal recipe, mmmkay? If you have ever wondered how do you make protein porridge, your mind is going to be BOGGLED at how super duper easy it is. Combine oats and cooking liquid (in our case, almond milk) in a pot and bring to a boil. 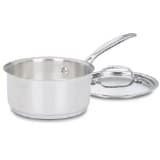 Once boiling, reduce the heat to medium and cook, stirring frequently, until the oats begin to soften and thicken. HOWEVER, it is VRY VRY key that you leave the oats a LITTLE runnier than you usually would. Protein powder is VERY absorbent, so you want it to have something to absorb! Once you’ve reached optimum creamy texture, stir in that protein powder. 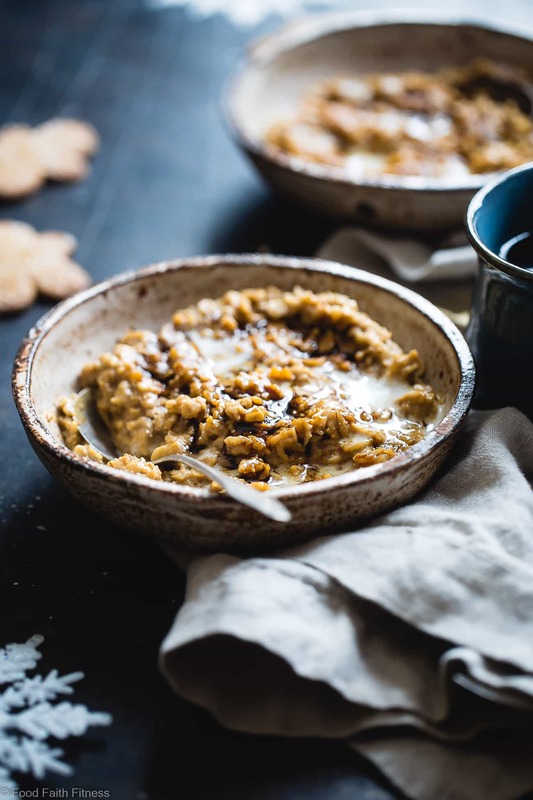 In the case of THIS protein oatmeal, you also need to stir in some molasses for the VRY obvious reason that you can’t achieve your inner-souls gingerbread-for-breakfast goal without it. 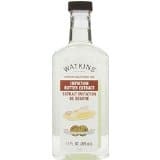 Also, butter extract. It is not necessary but is VRY VRY recommended to reach NEXT level gingerbread status. Don’t shortchange yourself with THIS level gingerbread when you could be onto the NEXT. You understand. 7 ingredients. 10 minutes. LOTS AND LOTS of protein. Cookie-like-tastes in your breakfast-loving-morning-mouth. Told ya. It’s gonna be happening on repeat for you too. 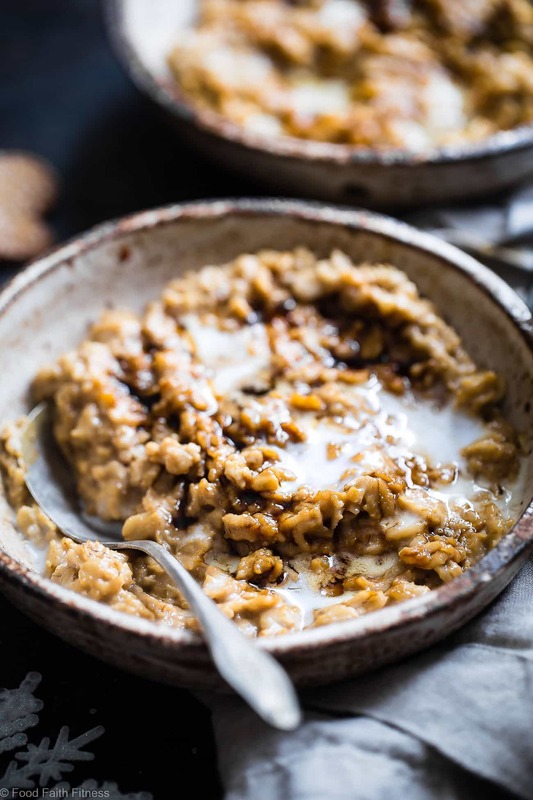 This quick and easy gingerbread high protein oatmeal recipe is a spicy-sweet, cozy breakfast that is healthy, gluten free and ready in only 10 minutes! In a large pot over medium/high heat, stir together the almond milk, oatmeal, cinnamon and ginger and bring to a boil. Once boiling, reduce heat to medium and cook, stirring frequently, until the milk is mostly absorbed, but the oats are still a little runny. Remove from heat and stir in the remaining ingredients until well mixed. Taylor this is just gorgeous, I can almost taste it from the photos, sharing and pinning today! You SO sweet! Thank you! Now, THIS is what I’m talking about! I love the holiday season but it’s overwhelmingly chalked full of sugar, dairy, and meat. It’s refreshing to see a healthier recipe that still resembles holiday cheer. I’m definitely pinning this for later! I totally know what you mean! Those things are good, just not SO MUCH! Hope you love this girl! I like combination of sweety and spicy flavors. Thumbs up for quick preparation of it. Thank you! I love these flavors together too! Ooh, Christmas in a bowl, HELLO! Do you think this recipe would be good with grated zucchini or carrots? I don’t think I’d recommend that! sorry!